After getting a few hours of well deserved sleep we both woke up even though we could have slept all day and grabbed our toiletries to take full advantage of the use of free hot showers. Yes, before I even had a chance to miss them. What I was surprised by was the way the showers worked. I guess I haven’t been to enough marinas to see if this is the norm, in fact I’ve only used the showers at Torresen’s and Milwakuee Yacht Club, but these ones only gave about 20 seconds of water before shutting off and then you’d have to hit the button again. Very smart I guess, and a great way to conserve water, but I think it took about six pushes to fully soak my hair. Back at the boat I was excited to finally dress for a warm day with a high near 80 instead of my foulies which I had been living in for the past few days. Eating a quick lunch on the boat since our daily spending money was now paying for a marina slip we headed down the street making sure to avoid all the manuer in the way. Walking down the main road in town it was crowded with tourist and not where we wanted to be. As soon as we found a nice side street we jumped over and found ourselves pounding pavement uphill towards The Grand Hotel. 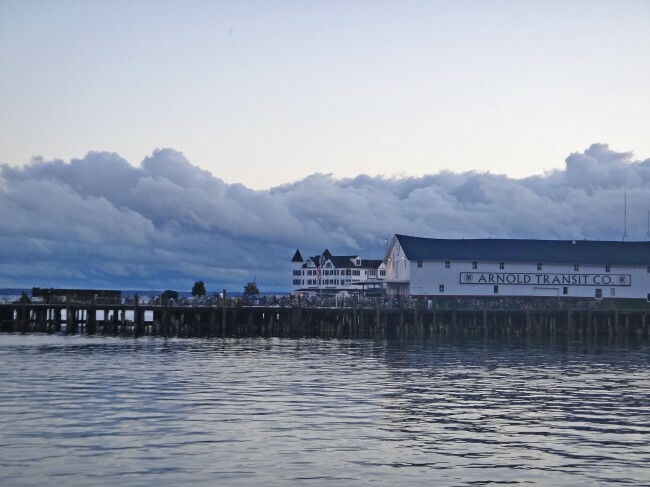 If you’ve never been to Mackinac Island it really is a sight to behold, with it’s famous front porch spanning 660 feet long, it’s right on the water and absolutely pristine. I’ve never been inside of it, especially since they charge $10 per person if you’re not a guest, but the photos I have seen do make it look like a majestic sight. Passing the enclosed carriages dispensing guests along the island we carried onward with no real destination in mind. Having decided to forego the popular cycling method of transportation anything we wanted to see that day had to be within a few miles of the marina because we were not going to have another repeat of Monday. Getting to the top of one hill there were markers of popular island destinations and the distances to them. 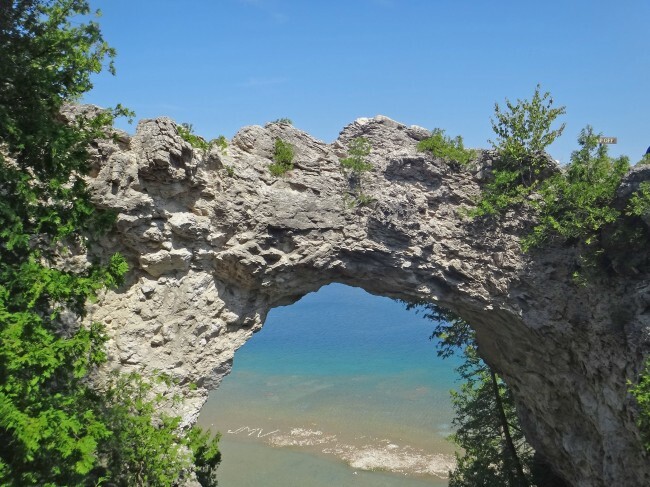 Arch Rock was only mile away and always a pretty sight so we took a right and continued walking. Along the way we passed For Mackinac which has a very rich history, and although we did not tour the fort we did catch a lot of information about it from the carriage tours tht were going at the same pace we were. Passing the fort and the Scout Barracks (more on that later) we made it to Arch Rock. I don’t know if I’m remembering this wrong, but I could have sworn that 15-20 years ago there was no gate or barrier next to the rock and people were free to climb on it. With a nice 200 or so foot drop to the road below. Either way, it’s definitely protected now but you can still take stairs out next to it and get beautiful views of the beaches below. 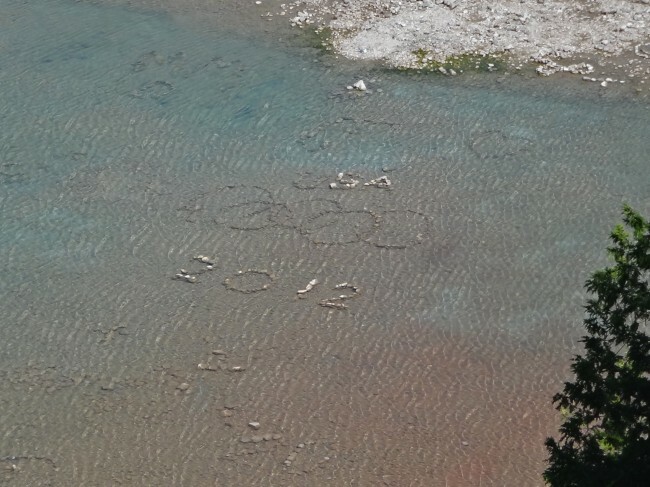 Waters must be shallower than normal this year because on the beach just below the rock someone had taken stones and rocks and placed them in an Olympic symbol for the 2012 games in London. Following the path back to the fort we were treated to a new group of Girl Scouts about to go on shift to be guides around town and we watched them march down the hill with vest emblazoned and counting off with each step. A little back story on the scouts on the island is that I used to be one. It’s not a permanent gig, just one week at a time and you have to apply and be chosen. Growing up I had been a Girl Scout from the 1st grade until I graduated high school. 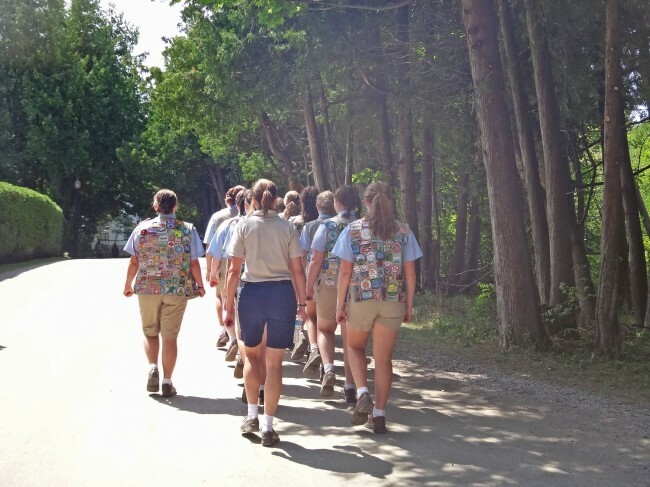 I had completed my Silver Award and Gold Award which are pretty big deals in the Scouting arena and the summer before I started my senior year of high school a couple of friends from my troop and I applied for and were accepted to the Mackinac Island Honor Scouts. My duties during my stay included raising and lowering the flag at the governor’s mansion or standing outside some of the museums to answer questions, and during down time we’d just hang out at the barracks. Since the uniforms we had to wear were very specific (my mom even had to make green polyester shorts and pants for me) I needed brown lace up shoes that would be comfortable to walk and spend all day in. Well since it was the only part of the uniform that I had any control over and I didn’t consider myself to be a total nerd at the time I went to the place that all the cool kids did back in ’99, American Eagle. While I was there searching for the coolest pair of brown lace up shoes I could find there was a very cute guy helping me out and his name was Matt. My girlfriend and I would talk and giggle when he walked away to bring me a different style or size shoe and I would gush about how absolutely gorgeous he was and I would be the luckiest girl in the world if I could ever go out with a guy like that. That’s right, this was the first time I ever met my future husband and I was buying shoes to be a Mackinac Island Honor Scout. Although he did take notice he didn’t ask me out that day, it took until that winter when I ran into him for a third time at a swim invitational where I was timing in his lane (if he looked good at American Eagle, he looked even better in a Speedo) and the rest is history. Anyway, back to 2012 when the two of us were walking down the road just behind this year’s Honor Scouts and I had to laugh as I remembered this was how the universe brought us together. We spent a little time after that relaxing in the cockpit and enjoying the yachter’s treat of meat & cheese & crackers before making our way back into town. There was a music festival going on and in the afternoon there was a live band playing at the Pink Pony that I wanted to catch. Not so much for the music, although it was enjoyable, but because I wanted to sit at the Pink Pony and drink a Dark & Stormy. On one of my last races in Muskegon I had been talking to Jules about the Chicago to Mackinac Race which she had partaken in many time and told me it was a tradition that as soon as you finished the race, no matter what time of day or night, you’d step off your boat and over to the Pink Pony where they’d shove one of these drinks in your hand. Now I may not be a Mac racer myself, but I figured it was a big enough accomplishment that we had gotten ourselves from Muskegon to Mackinac and I wanted to partake in the tradition as well. 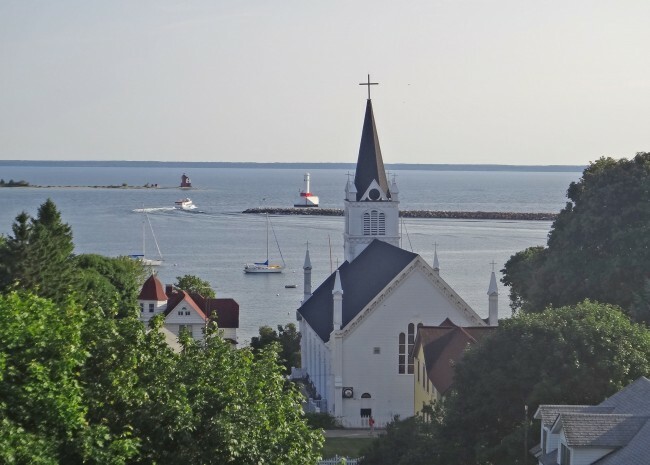 And while I am happy that I can now add sailing to Mackinac Island and drinking a Dark & Stormy at the Pink Pony off my list, next time I think I’ll stay away from the ginger beer and go with the fruitier rum runner. The rest of the afternoon was spent relaxing around the boat or taking walks through the streets with the permanent residents that had their Victorian style homes perched on the hill tops. Making sure to have an early bed time we planned on leaving early the next morning to start the trek to Lake St. Clair but we woke up to an overcast sky and a small craft advisory. Thinking that another night and $44 at the marina would be better than possible damage to the boat we planned to stay one more day with an early Friday morning departure. Since the rain was on and off all day we stayed on the boat and below deck finishing some much needed projects of moving things around and finally stowing things that had previously just been strewn around in an effort just to depart Muskegon before we were permanently moored there. By the time we had finished there was actually room to sit on the starboard settee now and we had also managed to squeeze in watching The Hunger Games with a bowl of popcorn. Now it’s time for a good night’s sleep and about a 48 hour journey until we reach the shores of Lake St. Clair and a chance to meet up with Matt’s mom & stepdad who are driving across the state to bring us mail/packages that have come after we left. That’s nothing! I had to wear knee high socks and a beanie hat. The storms that kept us put for one more day. You deserve a dark and stormy for admitting you where a girl scout that long,don’t worry I was a boy scout tell the end of high school and spent like 10 years straight traveling to the Mac . Post is just right keep it up. Can’t wait for are next adventure guys. Glad you guys are enjoying yourselves- live it up! Ron, being a girl scout actually made me a little more popular my senior year because everyone at school wanted to buy my cookies. Jackie, I thought you might like that story! 🙂 The countdown is on to see you guys, 4 1/2 months! !